WILMINGTON, DE � If you�re going to play �the track� at Delaware Park, most people would probably believe you�re heading off to lay down some bets on the ponies. Welcome to White Clay Creek. Looking from the bridge over the creek on the par four 1st hole. Get used to it, you'll see a lot of water on this course. Unfortunately for the horses, they don�t have much choice but to run in one direction, but Delaware Park�s golfers are greeted with a multi-dimensional challenge that weaves in, out, and around the limitless property of the racetrack. And if you�re there on a racing day, you�re treated to the sounds of horse racing as well. Having seen a great many golf courses, this one truly stands apart from the rest � largely because of its equestrian flavor. And, as it turns out, it�s a gift to golfers in the Mid-Atlantic region as well. I�ve been known to size up the horse-game from time to time, but these days, teeing it up takes precedence to lighting up the Tote board. 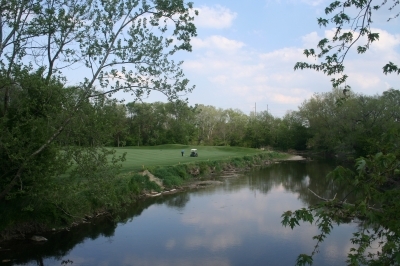 White Clay Creek gives the Delaware Park folks another attraction altogether, and it�s interesting way to broaden their business. From behind the par five 15th hole. If you're well placed off the tee, you may be able to go at this green in two. But even slight misses can result in severe penalties. Delaware Park racetrack has a distinguished history in and of itself. It opened in June of 1937, originally designed by William DuPont Jr. � and its convenient location drew crowds of 20,000 per race day (via train) from throughout the Mid-Atlantic region during thoroughbred racing�s heyday. The track thrived until the mid 70�s when other racetracks in the region began expanding their schedules, directly competing with Delaware Park � resulting in shrinking attendance and purses. Slots were introduced at the park in 1995, with the purpose of reviving the racing side of the business, and they�ve been successful in doing just that. �The additional purse money has helped us attract quality race horses, with the likes of Afleet Alex and Barbaro winning their first races here,� Sample said proudly. At 515 yards, the 8th hole is White Clay Creek's shortest par five... but that doesn't mean it's easy, as there are several stream crossings between you and the green. 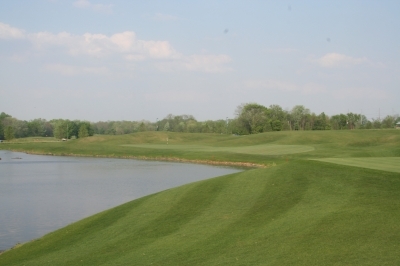 Perhaps coincidentally, we visited White Clay Creek on Kentucky Derby Day (2006), and it�s safe to say, whenever we think of the golf course, we�ll think of Barbaro as well. But while you�re out there, it�s hard not to think of the design firm of Arthur Hills/Steve Forrest, because the layout is decidedly challenging and fun to play at the same time. 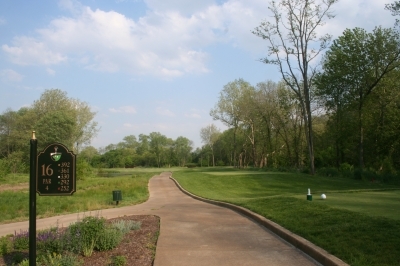 White Clay Creek isn�t for those who can�t hit it straight � but short and straight shooting golfers will find it to their liking, if playing from one of the forward sets of tees. Like most newer vintage golf courses, it�ll test that high-tech equipment you�ve purchased. �We were pleased to have an owner (Bill Rickman) who was committed to taking whatever measures were necessary to deal with the various issues associated with trying to create a world class golf course within the difficult natural setting,� Forrest added. Beauty and challenge describes the 444-yard, par four 11th hole. The Hills/Forrest people first heard about the project through Joe Hills (Arthur�s son, and co-owner of a couple Washington DC area courses), who knew Mr. Rickman � then Arthur Hills and Forrest interviewed with Delaware Park�s CEO, Bill Fasy, in December of 1998. The goal was to open the new golf course in time for the track�s centennial celebration, which would take place in July of 2000. Forrest said that might�ve been possible if they�d started right away, but the permitting process wouldn�t allow them that short of a timetable, and then Mother Nature took care of the rest. Every golf designer encounters problems at each individual site � but the need to avoid scaring horses probably doesn�t come around very often. There's not much room to miss side-to-side on the par four 2nd hole. Tee it up with whatever club you can hit straight. 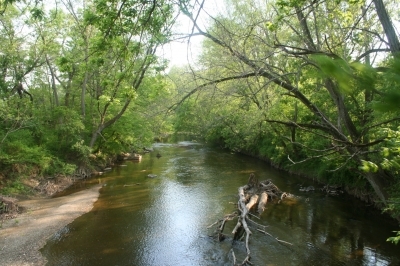 Whatever the obstacles, White Clay Creek finally opened on June 28, 2005. The initial buzz surrounding the course was that it�s difficult, but very beautiful. I�d say that�s an accurate description. 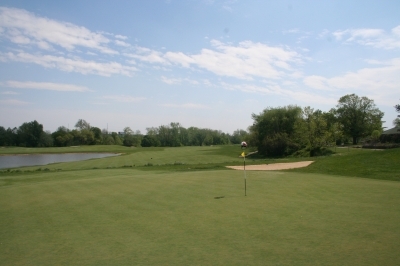 The most prevalent feature of the course is White Clay Creek itself, which you never quite seem to get away from � that�s the nature of the land, but sixteen of the eighteen holes contains a water hazard (hence, the absolute need to hit it straight). 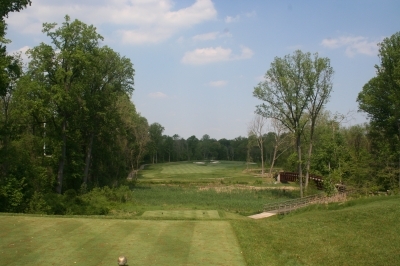 The layout won�t kill you with length, as the back tees are just a shade over 7,000 yards (7007). But if you hope to come away with your sanity � and your golf balls � you�d better take a good look at your cart�s GPS system from the first tee onward, and hit to distances. That environmental sensitivity and stewardship has lent itself to creating an atmosphere that�s pretty rare for a golf course that�s essentially located in a busy metropolitan area. A couple of the holes run close to roads, but overall, there are several corners of the golf course where it�s just you and nature. There are many places at White Clay Creek where it's easy to forget you're right in the middle of a busy urban area. This is just one of them. Oh yeah, then there are the trains. That�s true � but again, an AMTRAK express train can be just down the tracks. It�s amazing how fast they sneak up on you, always ready to test your powers of concentration. It's a long way from the back tees to the fairway on the par four 6th hole. If you're going to play from the tips, you'd better pack length and accuracy, or you're in for a long day. The facilities are also top-notch, including a large practice range, chipping area, practice bunkers and a putting green. Inside the clubhouse, there are locker rooms, a sauna, steam bath and fitness room, which Sample says are the best in the area. 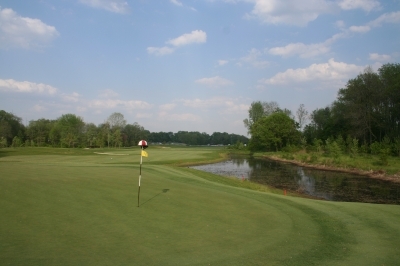 White Clay Creek also offers an Academy of Golf, which houses a year-round indoor practice area. It�s true � you could pen your own short story just on the trek from the second to third holes. One of the longest in-course cart rides I can recall, but it�s not distracting. 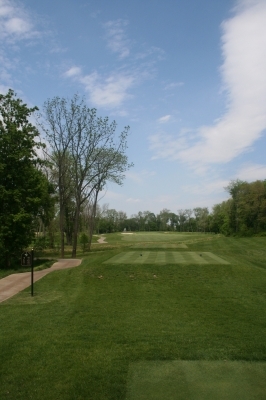 With large, mature trees throughout the golf course, White Clay Creek has the look of a much older layout. Here, the par four 16th hole. Hole highlights include the par four first hole, which immediately gives you an idea of what�s to come � because the green is separated from the fairway by the creek � and it�s not an itty-bitty span, either. There�s a bunker splitting the fairway landing area off the tee, so you can choose to go to either side, or over, if you can. But again, be aware of the creek! 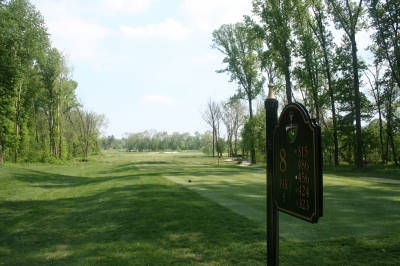 The par four sixth hole is probably the scenic highlight at White Clay Creek, but if you�re playing one of the two back sets of tees, it�s a heck of a carry to get it to the fairway. Sample says the longest bridge on the course takes you from the back tees to the landing area � and you�ll grasp just what makes this hole so tough. The 593-yard, par five 3rd hole carries with it the #1 handicap label, and it's well deserved. On the back nine, the aforementioned eleventh hole is a very picturesque dogleg right, with the creek running along the right-hand side, protecting the leg. It�s tempting to try and blast it over, but even a slight miss to the right will bring the water into play. Sample says her favorite hole is the par three seventeenth hole, with a large pond on the left side and grass bunkers on the right. 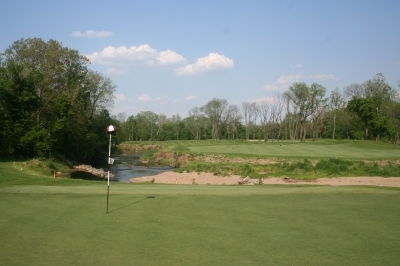 It�s White Clay Creek�s shortest hole, but from the tee it looks like an awful lot of water�s between you and the green. It�ll probably take a second round at White Clay Creek to fully appreciate it, as its �natural� difficulty will probably surprise you the first time around. In addition to the dominant presence of the creek, the Hills/Forrest raised greens complexes will also challenge you to bring your best game here. But it�s certainly worth making White Clay Creek part of your itinerary if you�re traveling to this part of the Mid-Atlantic. The service is excellent, and it�s convenient to local hotels and restaurants� and the horses, of course � all part of what makes visiting this new �track� a definite must. The par three 17th hole is White Clay Creek's shortest and 'easiest.' But it's still got its own kind of charm. When we traveled to Delaware Park, we stayed at the Hilton Wilmington/Christiana, located just off Delaware Interstate 95, and minutes from Delaware Park. Peak Season (May through September) -- $95; $75 after 2, $45 after 4. Shoulder Season (April, October and November) -- $70 before 2, $55 after 2 and $40 after 4. March and December -- $60 all day. All rates effective seven days a week, and include cart as well as access to the practice facilities and amenities.